I got really excited last year when my assistant told me that she and her family had found a way to save on their health care costs by switching to a healthcare sharing ministry. They have four young kids, and their health insurance premium was rivaling their mortgage payment. In an attempt to save some money, they switched to Medi-Share. She’s had a really positive experience, is saving a ton of money, and hearing her talk about it prompted this Medi-Share Review. My wife and I also use a healthcare sharing ministry, Liberty HealthShare, as another low-cost alternative to health insurance. Healthcare sharing ministries aren’t for everyone, and you’ll learn more about that in this Medi-Share review as I cover specifics like understanding what Medi-Share is, how it works, the costs, and potential pros and cons, like unlimited sharing for eligible expenses but paying out of pocket for preventative care. Medi-Share is a healthcare sharing ministry founded in 1993 and run through the non-profit organization Christian Care Ministry Inc. Medi-Share is a faith-based organization that helps like-minded individuals and families share in each other’s health expenses. The faith-based and like-minded parts are pretty important because there are some restrictions, religious beliefs, and expectations you’ll need to be comfortable with. They can affect whether or not you are accepted into Medi-Share and if all of your costs are covered. Medi-Share is not health insurance, which you’ll hear me say over and over again, but you still do pay into the plan every month with what’s called a monthly share amount. You can think of it as a health insurance premium, but it’s generally much less expensive. That share amount is put into a pool of money, held at a credit union, and then used to cover medical expenses that other members are sharing. M$M tip: Healthcare sharing ministries can save you a ton of money on health care while offering coverage that is really similar to health insurance. To learn more about why so many people are choosing healthcare sharing ministries and whether it’s a good choice for you, check out Is a Health Care Sharing Ministry Right for You? Let’s get into the details here because the idea behind Medi-Share and other healthcare sharing ministries is actually pretty cool. I will admit that the religious aspects will be a turn off to some people, but overall it’s an interesting concept. Everyone I personally know who uses a healthcare sharing ministry is really happy with their choice, my wife and I included. When you sign up for Medi-Share there will be a couple of one-time, non-refundable fees totaling $170. The application fee is $50 and needs to be paid when you apply. To apply, you can do it online or over the phone. The second fee is a $120 new member fee, and you will see that added to your first month’s share payment. You will also have to complete a Testimony and Commitment form, which is a three-page document that covers everything from religious beliefs, unacceptable behavior which can result in costs not being shared, as well as some legal issues. After you’ve completed the forms and have been accepted, Medi-Share opens a personal sharing account for you, and that’s where your monthly sharing amount payments will be deposited. If you have smaller medical needs, you can use their telemedical program and be seen and receive prescriptions in about 30 minutes. If you haven’t met your AHP, you pay for your medical expenses. However, because Medi-Share isn’t a health insurance company and you are considered self-pay, your medical costs are almost always less expensive than the cost billed to a health insurance company. If you have met your AHP, your eligible bills are shared by other members at 100%. Notifications are sent to Medi-Share members when there is a need, and in addition to covering your expenses, you might also receive well wishes, prayers, etc. One of the really cool things about healthcare sharing ministries is that they focus on creating a community. Know that you are 100% in control of what personal information is shared, but people in the Medi-Share community like reaching out and supporting each other with thank-yous, prayer requests, etc. But, if that’s not your thing, you don’t have to do it! Medi-Share uses a PPO network, and they encourage their members to use in-network providers, which keeps your out-of-pocket and sharing costs as low as possible. You can still go out of network, but you may have to pay an additional fee. Medi-Share is generally much less expensive than private health insurance or ACA (Affordable Care Act) plans. My assistant Mel and her family went from paying annual health insurance premiums of around $15,000 to just $6,600 with Medi-Share. AND, they still received high-quality care and reduced costs when she gave birth to their fourth child. I’ll be doing another article soon about her experience using Medi-Share for maternity coverage. 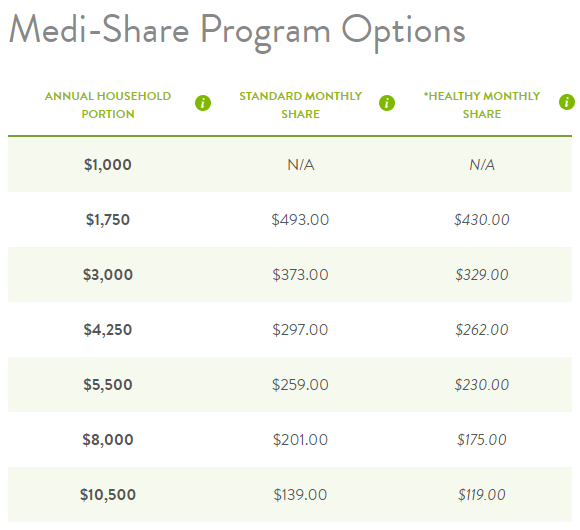 Medi-Share has a wide variety of plans available, and you can use their Share Amount Calculator to look at what Medi-Share will cost for you and your family. As health insurance companies, your total out-of-pocket cost is related to the amount you pay each month. Your monthly sharing amount is deposited into your monthly share account, and the amount in there is what is used to help cover the cost of expenses for other Medi-Share members. Medi-Share offers up to a 20% discount on your monthly share amount for households who meet “Health Incentive” standards, including waist measurement, weight, BMI, and blood pressure. This is a coaching and wellness program for individuals using Medi-Share who have elevated risk factors, like obesity, high cholesterol, or diabetes. This program encourages Medi-Share members to work towards reducing their risk factors and is mandatory if you meet certain criteria. Use of the program adds an extra $99 to your monthly share amount. Your annual household portion (AHP) is your annual out of pocket cost. Your Medi-Share AHP is the equivalent of an insurance program’s deductible. The amount you choose for your AHP will determine what your monthly share amount is. The higher the AHP you choose, the less you pay every month. Here’s an example of what your AHP does to your monthly share using a family of five. And because your AHP is an out-of-pocket amount you will need to meet before your expenses are shared, it’s important to pick an amount you can cover. And, remember those $35-$135 doctor’s fees that aren’t accounted for in your AHP. I’m saying “possible” here because some of the things on this list may or may not be positive or negative points for you and your family. And just a heads up, some of the things I’m going to list are related to politics, but M$M is as apolitical as possible. If you can please restrain yourself from blowing up my comments with your negativity, that would be great, thx! The reality of health insurance is that providers raise their prices when billing insurance companies, but because Medi-Share isn’t a health insurance company, the costs are lower and they pass that savings onto you. The ACA has limited enrollment periods, running November 1 through December 15, and not everyone is ready to shop around for health care during that window. Medi-Share is open to new members anytime, all year long. For some, there is something nice about knowing that you are surrounded by a community of people who share your religious beliefs and commitment to good health. Medi-Share offers an incentive to stay in good health or work towards it. Unlike Liberty HealthShare, Medi-Share doesn’t give you a max sharing amount for eligible expenses (see below about caps and limitations on pre-existing conditions). That means that for eligible expenses, Medi-Share covers 100% of your costs after you meet your AHP. Unlike some other healthcare sharing ministries and health insurance companies, routine and preventative care, like well-visits and vaccines, are classified as out-of-pocket expenses and are not eligible for sharing. Medi-Share believes that by offering low annual and monthly costs, you will be able to budget for routine and preventative care, which is often less expensive because you are considered self-pay. These are going to cost no one probably ever wants to deal with, but if you were in a car accident because you were drinking and driving, for example, Medi-Share will likely refuse to share your costs. The same goes for medical issues related to extra-marital affairs, like if you contracted an STD. Also, if you engage in any behavior listed in their Testimony and Commitment form, Medi-Share can refuse coverage. Medi-Share is generally going to be a better option if you don’t have any pre-existing conditions, but if you do, you may have to wait up to 36 months to have related expenses shared. Sharing amounts for pre-existing conditions that have gone 36 consecutive months without signs, symptoms, treatment, or medication are eligible for sharing up to $100,000. Sharing amounts for pre-existing conditions that have gone 60 consecutive months without signs, symptoms, treatment, or medication are eligible for sharing up to $500,000. Because it isn’t health insurance, you aren’t eligible for tax deductions for health savings accounts (HSAs), and you also can’t deduct your Medi-Share contributions like you can with your health insurance premiums. In addition to sharing the Christian beliefs outline in Medi-Share’s Testimony and Commitment form, you will need to sign a document stating that you follow those beliefs and you will also have to share your church information. Using Medi-Share for health care coverage isn’t going to be for everyone, and that’s okay. They have slightly more restrictions than Liberty HealthShare, but there are some bigger benefits to using Medi-Share, like no caps on sharing for eligible expenses. But, I’d say that for anyone who shares the same religious beliefs of Medi-Share, this healthcare sharing ministry can be a great, low-cost alternative to health insurance. Medi-Share and other healthcare sharing ministries are challenging the traditional insurance market, and that means lower costs for those of us using them. There will be some differences you’ll need to accept, and those might work well for your family. How much are you paying for traditional health insurance? That seems harsh that Christian health insurance would not insure “non-christian” things like drinking too much and then driving or getting an std in an extramarital affair. How does an insurance share determine whether the circumstances were un-Christian? Didn’t Jesus himself say in regards to a group of men about to stone a woman for adultery “He that is without sin among you, let him first cast a stone at her” in the Bible, John 8:7? Interesting post and option for healthcare but I just had to point out this strange insurance caveat.